This was my second trip since March 2009. 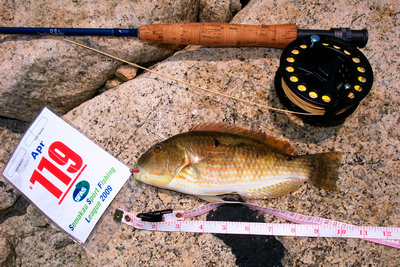 I decided to bring my newly bought TFO TiCrx 5wt flyrod and my baitcasting gear to this long awaited trip. 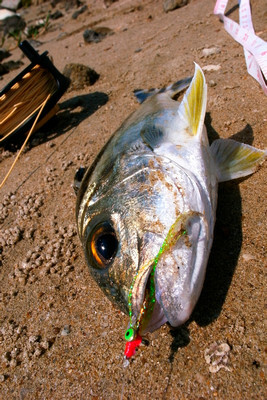 Weather was exceptionally hot and has been cruel to us leaving most anglers with a burnt out face. I did not land anything on lure but has been patiently casting lures around to cover grounds. Desmond’s friend managed to hook up a garfish soon after we arrived at southern tip. I decided to switch to fly gear to try hunting for some resident fishes which may be spooked by the vast array of lures chucked at them. 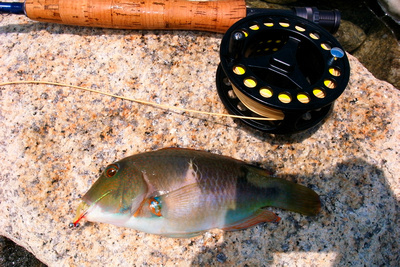 Soon I was rewarded with a crescent perch aka “kelong chi” on my size 8 charlie. Luckily it managed to grow up to 10 inches barely for me to qualify at least 1 point. Just minutes later, I got a firm hookup with a jumping tarpon. It brought me an additional 18 points to add on to my bag. I decided to change to a smaller charlie of hook size 12 and it exploded with a baby Spangled Emperor aka “Leng Jiam”. Charlies proved to be too tempting for the fishes after all. 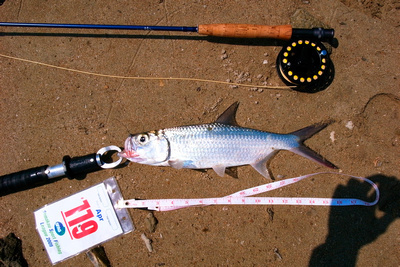 I move on to cover more grounds with occasional misses before another solid hook up on a 10 inches Seagrass Tuskfish. 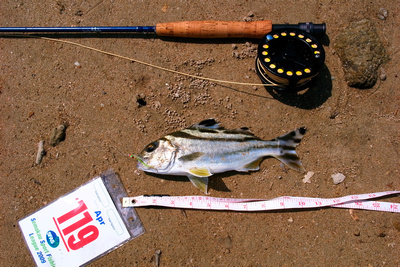 I was hoping to get another crescent perch but a small Anchor Tuskfish grab the micro charlie fly greedily.